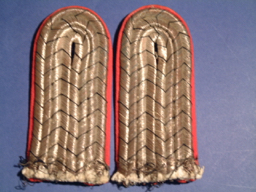 A pair of sew in lieutenants' straps. Dark blue wool bases with silver wire tops flecked with black and red. Pair of gilded metal pips and a single Reich crown to each. In very good condition.. Extremely rare original Reichmarine officers straps. 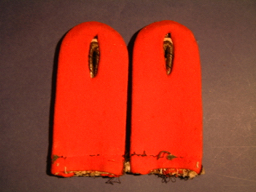 A pair of ''slip on ' Kapitanlieutenants' straps. Navy blue bases with silver wire tops flecked with black and red. 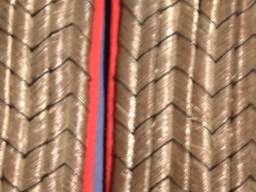 Pair of gilded metal pips to each. In excellent condition.. Extremely rare original Kaiserlichmarine officers shoulder straps. A. 57A PRUSSIAN INFANTRY LIEUTENNANTS PAIR SHOULDER OF STRAPS. 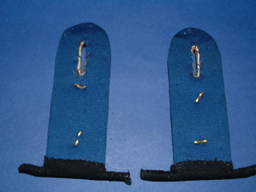 Pair of sew in type Prussian officers straps. Bright red bases with silver wire tops flecked with black. In very good (tarnished)condition.) 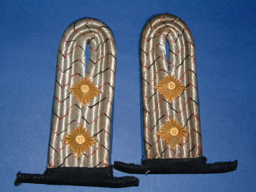 A nice pair of Prussian Infantry Officers shoulder straps .Absolute originals. A. 58 IMPERIAL PRUSSIAN VETINARIAN OBERLEUTNANTS SHOULDER STRAPS. 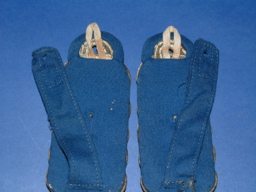 A pair of slip on leutnant's straps. Shocking pink melton wool bases with silver wire tops flecked with black golden snake and single gilt pip, in excellent condition. 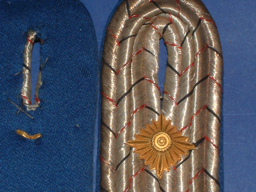 Rare set of WW1 officers shoulder straps. A. 61 IMPERIAL GERMAN SAXON MEDICAL OBERLEUTNANTS SHOULDER STRAPS. These are of early war manufacture. Sew in Type. Blue / purple Velvet bases Silver wire weave uppers flecked with Saxon green a with gilded snake wrapped round a staff and a single rank star on each,Also with the Bright green medical piping on the strap. Quite scarce now... Some wear to the top edges otherwise in very good condition. 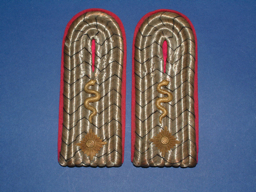 A.62 IMPERIAL GERMAN SAXON POLICE OBERINSPEKTORS PAIR OF SHOULDER STRAPS. These are of early manufacture. Sew in Type. 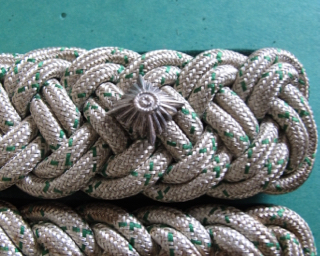 Dark green cloth bases Silver wire weave uppers flecked with Saxon green, a Pair of silver rank stars on each, Quite scarce now... In very good condition. A. 62 IMPERIAL GERMAN PRUSSIAN FIELD GREY MEDICAL LEUTNANTS SHOULDER STRAPS. These are sew ins for the Rock and are the long narrow type. Blue / purple velvet base Silver wire weave uppers flecked with light blue a with snake wrapped round a staff and a pair of rank stars on each,. The rank stars are all matched but two show slight tarnish. in very good condition. A. 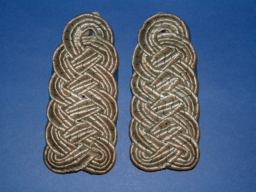 67 IMPERIAL GERMAN BAVARIAN MEDICAL LEUTNANTS SHOULDER STRAPS. These are of late war manufacture. Sew in Type. Blue wool base Very dark grey weave uppers flecked with blue a with subdued snake wrapped round a staff on each,. in very good condition. A. 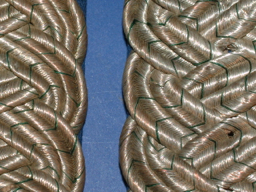 68 IMPERIAL GERMAN SAXON CAVALRY MAJORS SHOULDER STRAPS. These are of early war manufacture. Slip on Type. 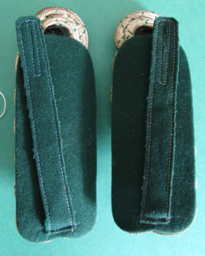 Mid Blue wool bases Silver wire weave uppers flecked with Saxon green. Quite scarce now... The colour is from one of the cavalry regiments. Overall in very good condition and very rare.